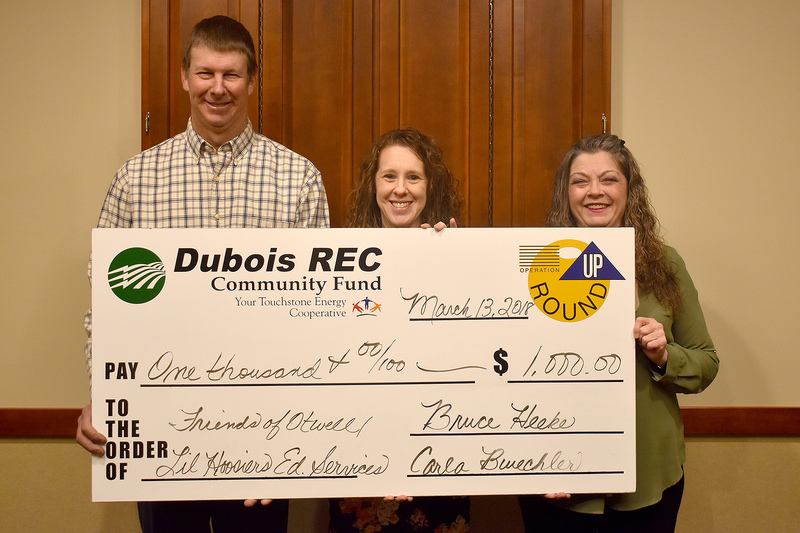 JASPER -- Trustees for the Dubois REC Operation Round Up fund met last month to award grants to seven local organizations. This brings the total amount of grants awarded in the community to$320,151.08 since 2011. Operation Round Up is just what the name implies. 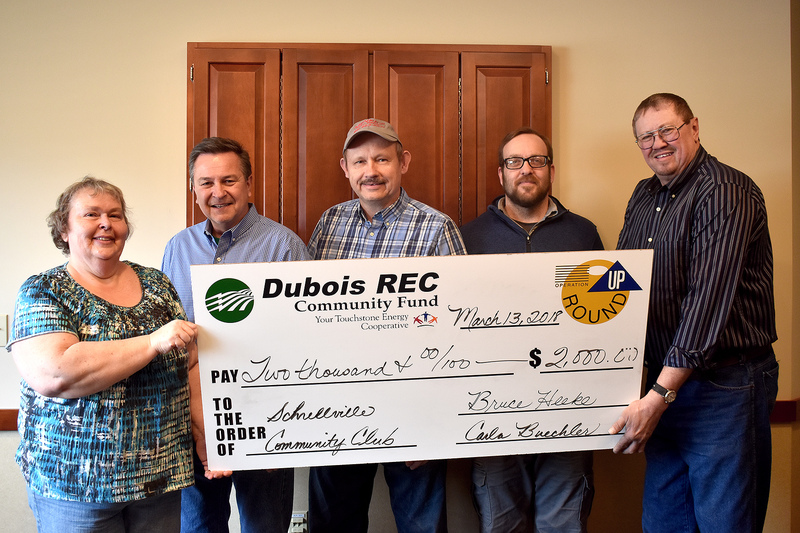 Dubois REC simply “rounds up” the electric bill of participating members to the next highest dollar. That spare change is overseen by a board of trustees, who are also Dubois REC members. Local groups and organizations can then apply for grants from this fund. 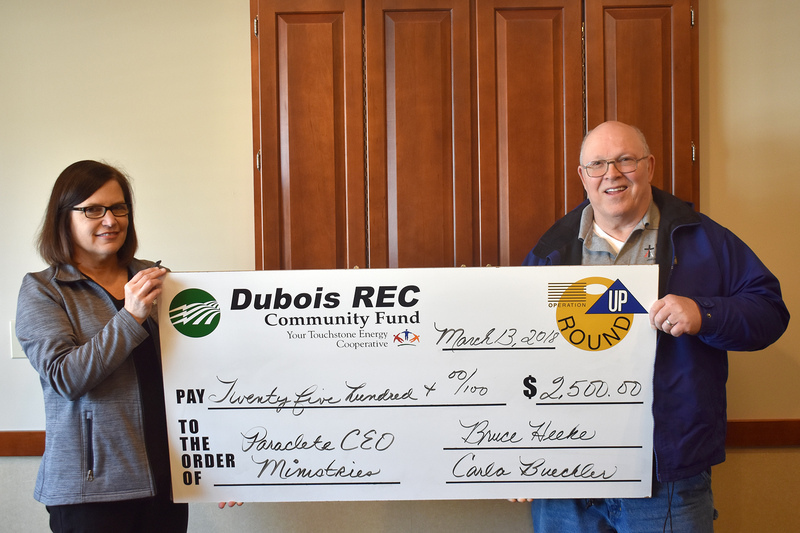 Those eligible to apply for the funds include groups or organizations located within the Dubois REC service territory, which covers the counties of Dubois, Crawford, Perry, Pike, Orange and Martin. Grants are available for local volunteer fire departments, youth programs, 4-H, senior citizen programs and other community service projects. The fund will NOT be used to pay any electric or utility bills or be used in any way to support or oppose any political candidate or campaign. Listed below are the recipients of the Operation Round Up grants that were awarded in the most recent grant cycle. Crisis Connection Inc. received a $1,300 grant for continued training for youth leaders. 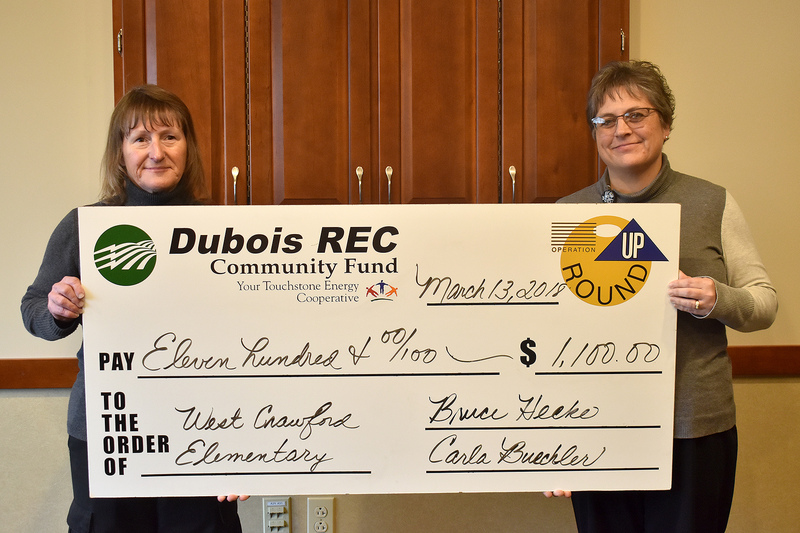 Dubois REC General Manager/CEO Don Book presents the grant to Kathy Gutgsell and Paula Rasche. Friends of Otwell/Lil Hoosiers Educational Services received a $1,000 grant to improve their existing preschool program and start a new Pre-K program. Operation Round Up Trustee Patrick Eckerle presents the grant to Jamie Jenkins and Rosemary Rhodes. 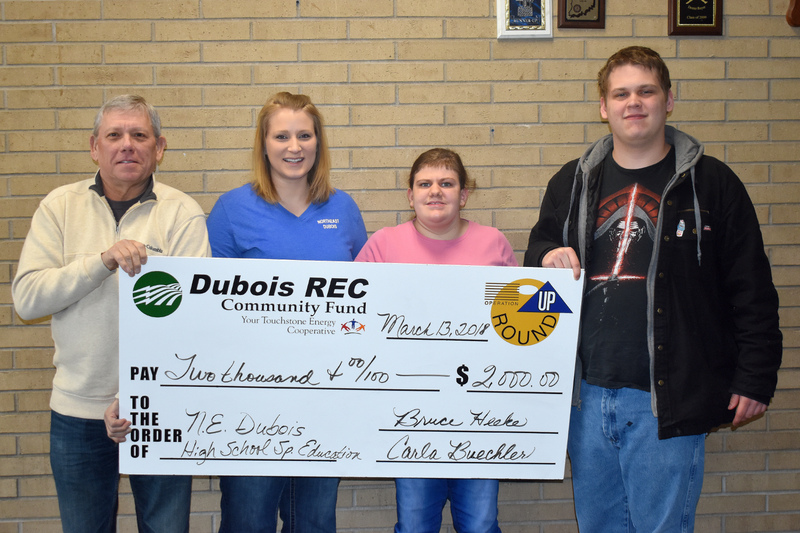 Northeast Dubois High School Special Education received a $2,000 grant for students to purchase supplies for life skills lessons. Operation Round Up Trustee Bruce Heeke presents the grant to Teaching Assistant Brooke Atkins and students Shilah Hulsman and Sebastian Smith. Paraclete CEO Ministries was awarded a $2,500 grant to help purchase a cooler to store produce which is later distributed to low income residents, food pantries and other community organizations. Operation Round Up Trustee Elizabeth Englert presents the grant to Patrick Kellems. Schnellville Community Club received a $2,000 grant to upgrade the lighting in their facility to more efficient fixtures. Operation Round Up Trustee Susie Brown presents the grant to Tony Mehringer, Myron Betz, Mark Knust and Don Reckelhoff. St. Patrick’s Celebration, Inc. received a $2,500 grant to help purchase a rotary broom to clean streets and curbs. Operation Round Up Trustee Robin Small presents the grant to Sharon Seifert and Bob Bleemel. West Crawford Elementary School received a $1,100 grant to help fund art and music programs for students. Operation Round Up Trustee Cindy Belcher presents the grant to Becky Weisman. 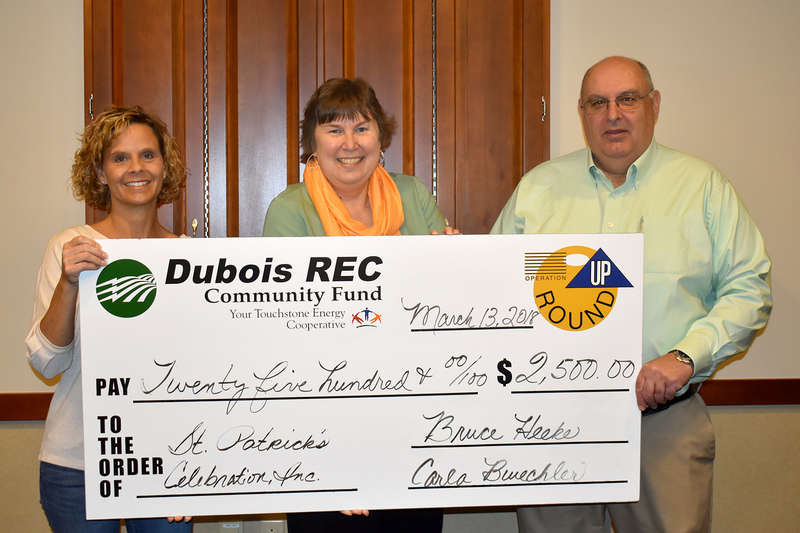 Dubois REC will accept applications for the next grant cycle of Operation Round Up® grants May 1-25. Grants must be submitted before 4 p.m. on May 25. 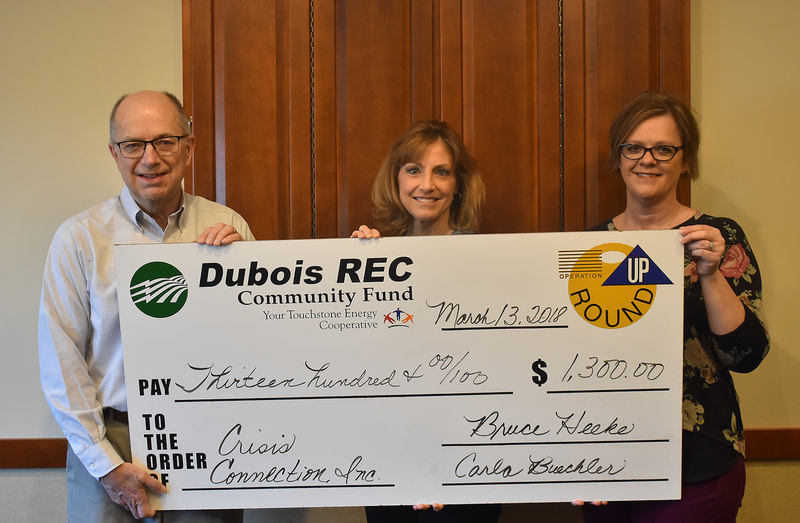 Representatives from local civic groups, non-profits or community organizations who would like to apply for an Operation Round Up grant can download the application forms from www.duboisrec.com. Applications are also available at the Dubois REC office, by calling 812.482.5454 or sending an email to Kyla Jones at kylaj@duboisrec.com.